Are you having trouble managing your medicines or forgetting doses? If you or someone you are caring for need to take several different pills every day, with various pills being taken at different times of the day, it can get confusing. Our Pharmacists can take the stress out of managing multiple medicines by preparing a weekly blister pack which organises your medicines into easy to manage dosage packs which contain everything you need to take at a particular time of the day. 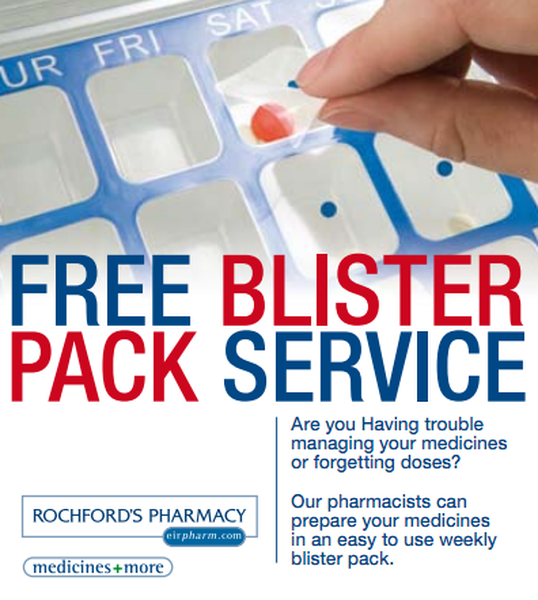 To see a sample blister pack or to avail of this free service just ask a member of pharmacy staff. We provide this service free to all patients including Medical Card holders.